For every day that you hit your writing target, mark it with an X on a calender. Do this until you have a row of uninterrupted crosses. A visual marker of your achievement. I encountered this exercise in Oliver Burkeman’s column in The Guardian. Morning Pages requires you to write stream-of-consciousness style, in longhand, first thing in the morning, filling three sides of paper. You can write about anything you want: diary passages, crazy ideas, angry tirades, ambitious plans. But it has to be done first thing and it has to be three sides. Because around the two-and-a-half page, that’s often where pay dirt occurs. Equally you should stop after three pages to avoid being too much in your own head. Having cleared out the brain, you’re ready to start the day. The benefits seem legion. Burkeman summarizes it thus: “Perhaps I shouldn’t have been surprised at how powerful Morning Pages proved, from day one, at calming anxieties, producing insights and resolving dilemmas….Morning Pages create a metaphorical private domain – one so valuable, I find it hard to imagine I’ll ever stop”. This feeds into both resolutions one and four. I rely on successful pitches to make money. And I will definitely need more money next year (see no. 4). More than that, everything I do and want to achieve – recognition from editors; a bigger name for myself; more assignments – depends on me pitching more. Therefore I’ll endeavour to pitch more frequently. But I can’t put in place some hare-brained plan to send out a pitch each and every day as I cannot foresee the quality of those pitches guaranteed. So I will start with two pitches a week. Every week. The equipment I own to make videos with. Next year I will definitely be pushing into video storytelling. Now really is the time to be learning the techniques and processes of how to make video. It’s the way of the future, especially as we’ll be consuming so much of it through our mobiles (and that definitely goes for journalism; it will take over from 24-hour rolling TV news I predict). Aljazeera is already capitalizing on this trend with its brilliant mobile app AJ+. What I like about video is that it’s visual storytelling. That’s the strength of this medium, and I see too much video that does not take advantage of its strengths, and that could have worked equally as well had it been a podcast or an article. It is storytelling that can have a journalistic edge but what I like about video is that I can afford to be more creative, more story-focused and freer in this medium. I want to learn the fundamentals, the building blocks of good film-making. With basic tools. This point is very important to me. I am a firm advocate of Limited Resources Filmmaking – that is to make video using the tools and equipment that you already have at hand. I will not be suddenly investing in expensive cameras, the latest lenses and the most professional editing software. That is the fundamental mistake I believe most amateurs make. It is instead about developing your own style: learning, playing, creating through the fun of using basic tools. It is easier to develop a style when you can slowly master basic tools. I will be using a Canon S120 compact camera and Windows Movie Maker until I feel worthy enough to upgrade. 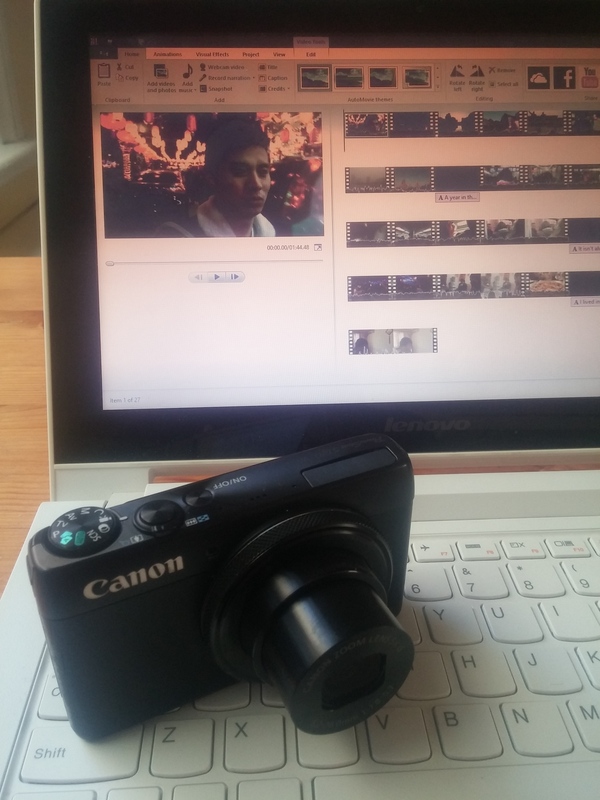 For more on this, see my post: Getting into Video Storytelling: using a cheap compact camera. This is a bit of a selfish one but I feel that your twenties are the best time in your life to do two things: 1. Build your career 2. To do the things that you really want to do. A lot of people want to travel. And you will have no better time then during your 20s to travel, when responsibilities do not include children, a senior job role and a mortgage. I will continue to combine travel+journalism (about which I’ve written on this blog) but mostly I want to experience the momentum of travel again and to have more experiences. Because regrets always pile up the older you get. Burma, South Korea, the south pacific and America are all on my card for 2015. This one I know will be one of the harder resolutions to maintain. But it’s for pride and for the future. It’s important that I learn everyday, even if it’s just 15 minutes. Here’s a link for the most useful methods (scroll a third way down). We are all guilty of fantasies and projecting; the warm daydreaming of our imagined and certain future successes. This is dangerous. There have been studies that show this imagined reality actually diminishes our prospects of achieving them. The logic is simple: our imagination is a powerful thing and the brain loves illusions, especially when they feel so warm and safe, and so it believes imagined successes are actually real. It makes you more complacent and less motivated to do the hard work that will make those delusions come true. I’ve come to realize that 2014 has been a lesson in this; a creeping cloud whereby my imaginations of success has smothered gritty determination. Next year I will do well to remember that I have so much more yet to do, and that I have barely achieved anything at all. That will be my spur. Reference: How to be fitter, happier and more successful: stop dreaming and start getting real from Oliver Burkeman’s column. Brilliant piece! So much of it is basically what I keep telling myself, yet fail to deliver. Instead of writing a whole list of resolutions, I will be able to simply use this one, with a few exceptions, for a more productive and rewarding 2015! Great inspiration, thanks! Thank you Alex! I hope it’s useful and good luck!